Home to the ancient Temple of Poseidon, where Lord Byron inscribed his name in 1810, Sounio is a majestic peninsula on the Aegean sea. Often viewed as a day-trip from Athens, there's much more to this place than merely an excursion. Spend a few days enjoying the stunning landscape, fascinating history and use it as an opportunity to relax in some of the best places to stay in Sounio. Visiting the region without exploring the incredible Temple of Poseidon would be a cardinal sin. Perched atop a cliff-face looking out over the Aegean, it offers staggering views especially at dusk or dawn. The surrounding coastline is home to a number of great beaches, so if your not exploring the antiquated history, recline on one of the sandy shores along the coast. The finest being Kape beach and Sounio beach. Beautiful trekking opportunities in the nearby Sounio National Park. Take day boat trips to explore the surrounding islands such as Patroklos and Makronisos. Sounio is steeped in history as well as local charm and our selection of the best places to stay in Sounio reflect that rich combination. Taking architectural inspiration from the Temple of Poseidon, Cape Sounio is a glorious hotel overlooking the Aegean. With luxury at every turn and access to two private beaches, it's the perfect place to relax on the peninsula. Sounio doesn't have its own aiport, but is easily accessible from Athens International Airport (35 miles). Travelling in Sounio and the surrounding area is well suited to having your own car, so visit our online partner Rentalcars for the best car hire prices. If you're in search of summer sun, then head to Sounio from June to August. However for those looking for slightly cooler times to visit, the months bookending the summer are perfect. 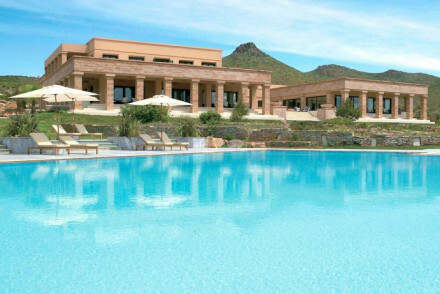 Browse through our list of the best places to stay in Sounio. Extend your search to the best places to stay in Athens. Or if your looking for some personal travel expertise, contact one of our friendly gurus. With its lagoon pools, private beach, palm trees and bougainvillea you could be forgiven this was a luxury Caribbean resort, rather than an idyllic Grecian hideaway.There are several smart dining options ranging from fresh seafood to modern Mediterranean - with views of the Temple of Poseidon.